Students interested in learning more about Beinecke Scholarships and other prestigious awards should contact Megan Friddle in Emory's National Scholarships and Fellowships Program. Find more information or schedule an appointment through the National Scholarships and Fellowships Program website. Chris Batterman, an accomplished jazz bassist, has long known the link between music and culture. In a first-year seminar at Emory College of Arts & Sciences, though, it clicked that studying those connections could play into the question of identity. 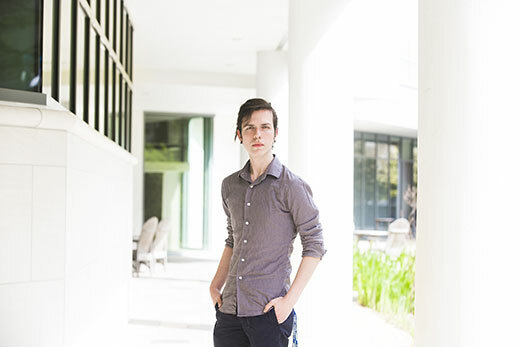 His success at examining those crossroads won Batterman, now a junior with a double major in music studies and psychology, one of just 18 Beinecke Scholarships given this year. The prestigious award comes with $34,000 to help defray the cost of graduate school: $4,000 prior to entering and the rest while attending the graduate school of his choice to pursue a PhD in ethnomusicology, or the study of music across different cultures. The Beinecke award is designed to support graduate education for students of “exceptional promise” who select study in the arts, humanities and social sciences. Batterman already had the tools to excel in cultural study of music. A performer with the Emory Jazz Ensemble, he also works as a tutor at the Emory Writing Center and seeks interdisciplinary views as an IDEAS Fellow. Examining how music addresses and shapes identity, especially for marginalized groups, is an outgrowth of Batterman’s curiosity that Laura Emmery, an assistant professor of music theory, observed firsthand. Batterman was in her upper-level course that taught undergraduates how to work with primary sources and analyze them to create narratives about music. Batterman, who is Mexican American, submitted research on the impact of that community’s folk songs on the Chicano Civil Rights Movement. The work exceeded expectations, including information he unearthed from the Library of Congress, in its argument that Chicano artists used the music to both reflect their newly constructed identity, as well as to contest dominant narratives of political and social marginalization. He has since presented his research at three national and international conferences and is preparing it for a peer-reviewed journal. Being able to make those connections, and understand the music on so many levels, tells Department of Music Chair Kevin Karnes that Batterman was already thinking about music as a field of cultural expression. The department has worked to position itself as the home for that serious discussion, leveraging Emory’s excellent liberal arts and sciences to showcase how music interacts with other disciplines. That Batterman is the second Beinecke winner in two years — senior Mallory Carnes won last year for her work in ethnomusicology — is a heartening indication that the approach is working, Karnes says. Batterman’s honors thesis, for instance, requires more than his knowledge of music. After six semesters of Portuguese at Emory, he is fluent enough in his third language to examine letters and notes written by and about Antonio Carlos Gomes as he composed “Il Guarany” and "Lo Schiavo" in post-colonial Brazil. In doing so, Batterman hopes to better understand how Gomes' work reflects notions of Brazilian identity, especially in terms of race and indigeneity. For instance, Gomes adapted the “Il Guarany” libretto in Italian and used musical devices very Italianate in nature, reflective of his idea that Brazil was more a European than New World country, Batterman says. Still, the opera is inflected with native rhythms, a musical hint to his plot, in which an indigenous man dies to save a mixed-race couple. The symbolism: Brazil’s origins must perish for the modern, whiter state to excel. Batterman plans to focus his doctoral work on overlapping trends in Mexican and Brazilian music in the 19th and 20th centuries. He is considering several ethnomusicology programs, including those at Columbia University and UCLA, where affiliated institutes focus on the history and culture of Latin America.